This spectacular tropical epiphytic orchid has recently been separated into a new Genus along with D. mirbelianum (Mangrove Orchid), previously both were included with Dendrobium. It must surely rank as the longest-caned Orchid, with the flowers pictured on a cane over 2 metres in length. 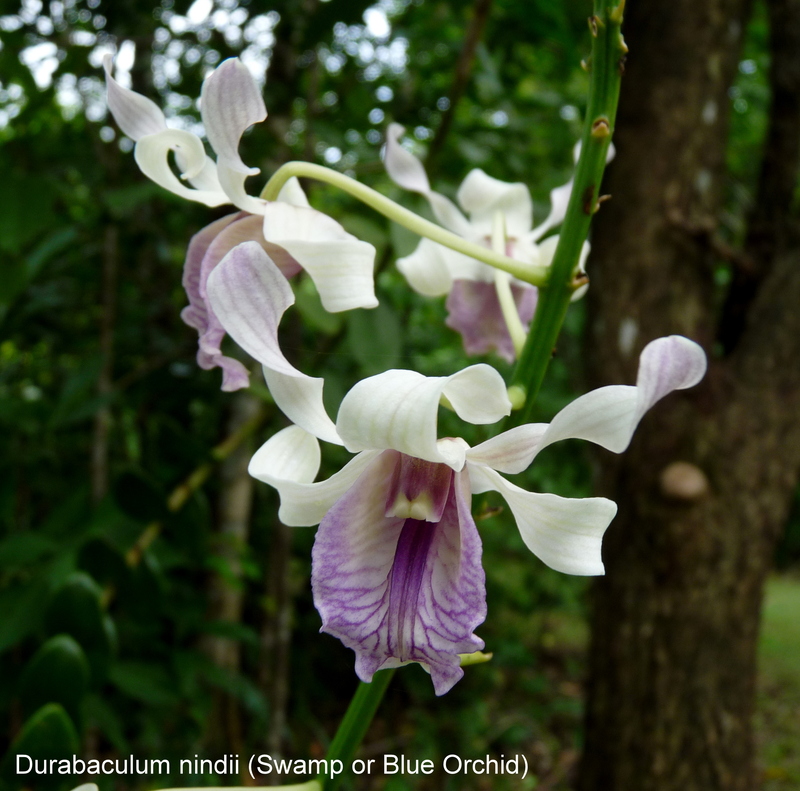 Unfortunately many Durobaculum nindii have been “saved” by avid Orchid lovers not content with seeing a plant in its natural state. At Wild Wings & Swampy Things finding a flowering native orchid which has naturally established itself is one of the rewards we enjoy as areas of revegetation mature. This entry was posted in Daintree Plants, Orchids and tagged Swamp Orchid. Bookmark the permalink. Its a triumph of a revegation project, to find such a wonderful plant growing in your “patch”. Congratulations. My local Orchids are mostly tiny, by the way. You Queenslanders do things differently. Just looked it up in Jones’s book, and he says it is “endangered”, with a very restricted distribution. All the more reason to treasure it. Thank you – we appreciate your enthusiasm. We also have some very small orchids eg. Oberona titania; Sarcochilus minutiflos. Future postings perhaps? I concur with Denis. Hard to beat seeing a beautiful plant like that in its natural environment. We’re lucky to live in such a special place and its fun to share some of the highlights with you and others of like mind.